Today we are taking a look at awesome Rube Goldberg™ style toys that allow you to make some chain reactions or make some Rube Goldberg Machines™. Everything on this list of Rube Goldberg Ideas is awesome for helping boys learn in a fun and super engaged way. The items found here are great for the whole family! A Rube Goldberg Machine is a complex machine made to do a simple task. For examples you can take a look at some of these videos but to give you an idea, it would be a long chain reaction of events that closes a door or rings a bell. Something you could do very easily but instead make a complicated machine to do so. In this article we are featuring toys that can be used in Rube Goldberg machines or offer a chance to build a chain reaction. In and of themselves marble runs are only a Rube Goldberg style toy if you add a task to the end. Marble runs are also awesome to use when combined with other toys and supplies to make a neat contraption. 2. This roller coaster marble run is a winner. The wonderful thing about this is that it can be put together and taken apart and put together again in many different configurations. It is a great mental exercise in construction. Use it to link to other parts of a machine or just have fun with it on its own. 3. The Odyssey Dual Motor Marble Run is a pretty neat toy. I love the motor aspect to it. It looks like it is made to construct in one formation but I am betting, if you were a bit creative, you could take the parts and create new designs and use them for other things as well. We have and love both of these sets and they have been used a LOT! Both are highly recommended. 4. If your kids like building contraptions, you should give this set a try. 5. For a chain reaction set this is the one to go for. As I said, we got both and they are awesome! I know a lot of you like wooden toys. You value them for their natural aspects, as well as how well they last. I am a fan as well. Here are a couple of sets that can be used on their own or with other building materials to make your machine. 6. The 50 Plank Contraption set allows one to use physics to move a ping pong ball through the track in a variety of ways. It is a lot of fun but does have some limits because of the size of the set. There is a larger set with more pieces listed right below. 7. If you want a nice wooden set with more pieces you should buy the 200 Piece Contraption set. It comes with an idea booklet and since there are more pieces there are more possibilities. 8. This may well be the ultimate of Rube Goldberg machine toy! This is going to get your boys thinking! When I saw this I knew I had to share it with you. It is called the Chaos Tower (see image above) and it is 78″ high and has 602 pieces. This is one neat looking toy. You take the pieces and make a frame, then use the included chutes, slides, funnels, baskets and bouncers to create your Rube Goldberg Machine™. It also comes with a motor driven chain that lifts a ball to the top and then drops it into your creation. Very cool! Here are the misc. sets and games that we found. You knew the classic Mousetrap would have to make an appearance in this Rube Golderg ideas list but there are other good finds as well. 9. This one is perfect for young and old. (I think it looks like a blast!) Includes 13 feet of track and tubes. 10. If you are looking for a STEM challenge try this Zoob set. I included it because the goal is very Rube in that you need to solve challenges, such as hitting targets and making balls bounce. You can totally use this in so may ways. One small note about Zoob. If you already have it you know that it can be a finger pincher if you are not careful. Just teach kids the best way to put them together and all is well. 11. And, of course, we have to include Mousetrap. The classic, totally perfect, Rube Goldberg style toy. We love this and often skip the game and just play with the pieces. 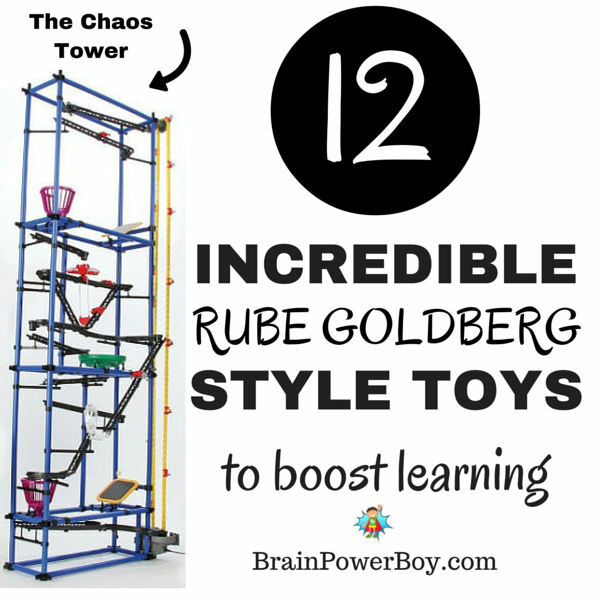 What an awesome collection of fun Rube Goldberg style toys. We have our eye on a few that we don’t yet own. The ones we do own are used a lot and have been excellent purchases. I love long lasting toys that have a lot of play value, don’t you?! If you like this list of toys and are looking for a gift for your boy, try our gift ideas for boys for many more neat ideas.